If you haven't read Lit! 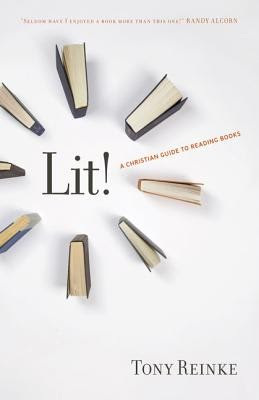 : A Christian Guide to Reading Books , by Tony Reinke yet - you should. You really, really should. I read it for the first time last year and while I wouldn't say that it revolutionized the way I read books, it definitely re-set my goals and standards. Reading is a pleasure for me (and so many of us) and that's as it should be. However, I don't know about you, sometimes my desire to simply enjoy a quick, fun read keeps me distracted from better reads. Also, my position as a book reviewer effects the time I have to read. Reading Lit! last year was just what I needed to give myself permission to be even more picky about what I accept for review and how I spend my time reading in general. At the conclusion of reading this book in 2011, I made the statement that I thought this was a book I should re-read every year. I would like to revise that remark! I think it is a book that I should feast on in slow detail every few years but not necessarily every year. I skimmed it to start off my 2013 reading year and that seems just fine. Personally comparing my 2011 reading list with my 2012 list assures me that reading Lit! : A Christian Guide to Reading Books had a definite impact on things. I spent more time reading classics. I was also intentional about re-reading books. That might be the greatest difference between the years right there. Both Reinke and C.S. Lewis are great proponents of re-reading books and with even the few titles I managed to re-read in 2012, I would have to say I agree with them. I've discovered in re-reading that there are certain books that I've grown out of. There are certain books that I grew into. And there are others that, as it turns out, I didn't really need to re-read at all because they didn't challenge me as much the second time 'round as the first. Realizing the relationship that one can build with a book or an author was something that definitely hit home to me this past year. Also, in re-reading the New Testament (presently) I find myself with a desire to understand what I am reading on a deeper level and I have this series by R.C. Sproul that I would like to make use of. And there it is. If it is most important to develop a biblical worldview (and I believe that it is) and it's a labor intensive thing (certainly) and if my reading time is limited then I shall have to set priorities. To put that another way: all books are lawful for Christians to read. However, a Christian ought not to leap into any book blindly until they have spent time solidifying their worldview by first spending time in God's word and by hearing faithful preaching and teaching of the Word. The dangers of not doing so are immense and I've realized that my worldview could use some sharpening up! That said, I purpose to spend 2013 focused more on books which refine my worldview and continue to shape it so that it is in line with the Bible. That's not said to sound snotty or self righteous in the very least. It's a personal acknowledgement that I haven't been paying attention to the Word of God as much as I've spent time paying attention to other things. Neither do I feel guilty for anything I left read or unread because I still learned and grew as a reader, a person and a Christian last year. I am content with where I've been, but not so very content to not want to spend a bit more attention to the details of my faith. That's all I'm saying. For it is ever onward and upward, to paraphrase Lewis. I'm glad to have breezed through Lit! again. This remains high on the top of my recommended reading list, for sure! And no doubt I'll be back for another re-read myself. Because there is always more room for change! Amen. I still haven't read Lit! (For shame! ), but I am right there with you in wanting and planning to spend time in God's Word. I was encouraged by a post from Heather (Lines From the Page) about how she read the entire Bible last year. My mind wanders because I lack discipline, but this morning I read 5 chapters of the Bible. (I'm not bragging, just trying to show my intentions.). I pray that God will open my mind to His Word and keep plugging away, despite my wandering mind. God bless you in your efforts, Carrie! I haven't read Lit! either, but I do like what you have shared here. I still do have to "make" or push myself to read nonfiction (that is not in story form) even when I find it beneficial and helpful. And it's of vital importance to keep the Bible first and keep ourselves balanced thereby as we read what others have written. When I stopped blogging, I noticed that I was reading more and more YA fiction. While there's nothing wrong with that, it was ALL I was reading. I've really started adding the non-fiction back in lately, and realize how much I need it. Review books keep me motivated, apparently. If that's what it takes, I'm all for it. :S I still need to do better with Bible study, though. I remember many points in this book, but I do need to at least scan the book and look through my notes again soon. I'm glad you recommended it! P.S. I'm glad you recommended Pursuing Peace, too. That is one convicting book, to say the least.